Episode #136: Happy Birthday, Lucy Lane! 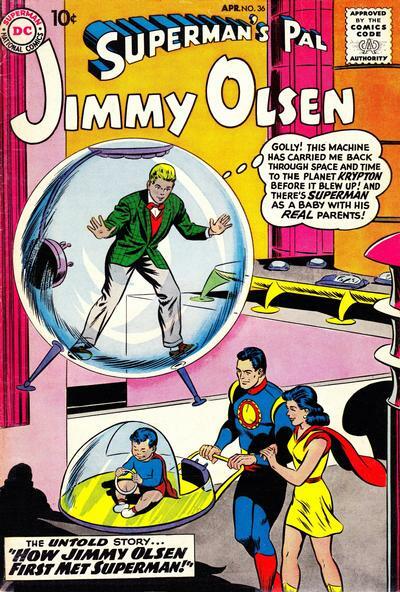 Superman's Pal Jimmy Olsen 36, April 1959, where Lucy Lane first appeared in the issue's second of three stories! According to the Superman Homepage website http://supermanhomepage.com, Lucy Lane's accepted birthday is July 25. She is the younger sister of Daily Planet reporter Lois Lane. This episode explores Lucy's silver age and post-Crisis histories and some of her earliest stories. Lucy Lane first appeared in SUPERMAN'S PAL JIMMY OLSEN 36, April 1959. This story was reprinted in SHOWCASE PRESENTS: SUPERMAN FAMILY vol. III. Since I only have the first volume of this reprint series, the plot synopses I use in this episode come from MIKE'S AMAZING WORLD OF DC COMICS at http://dcindexes.com. Next Episode: AN IMAGINARY SUMMER 2010, PART II: WAVERIDER AND THE ADVENTURES OF SUPERMAN ANNUAL 3, 1991! Episode #135: An Imaginary Summer 2010: Waverider & Superman Annual #3, 1991! Episode #134: Truth, Justice And All That Stuff! 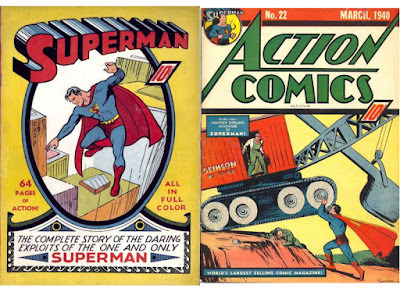 (L to R:) Superman 1, 1939 cover drawn by Joe Shuster, according to Mike's Amazing World Of Comics, while the Grand Comic Book Database and the Comic Book Database credits Leo O'Maliea as the cover artist & Action Comics 22, cover pencilled by Joe Shuster and inked by Paul Cassidy! This July 4th holiday was the perfect time to compare Superman's most familiar introduction as champion of "Truth, Justice and the American Way" and his original as "Champion of the Oppressed". Superman stories that are highlighted in this episode are SUPERMAN issue 1 and the untitled EUROPE AT WAR story from ACTION COMICS 22, March 1940. Episode #133: Happy Birthday, Dan Jurgens! 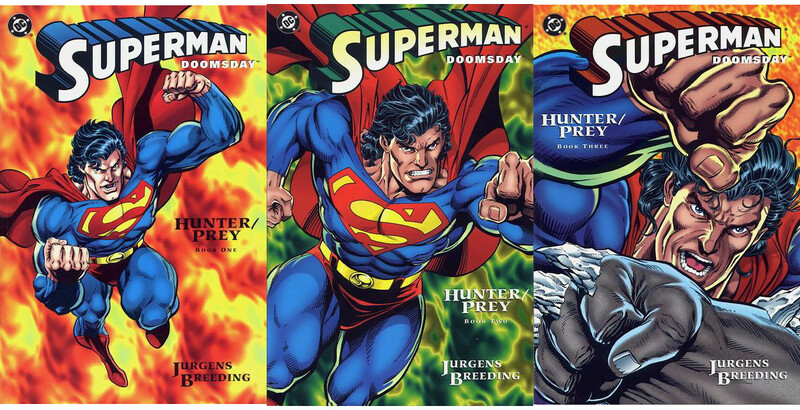 (L to R:) Issues 1 - 3 of Superman Doomsday: Hunter/Prey, cover pencilled by Dan Jurgens, inked by Brett Breeding and colored by Greg Wright! 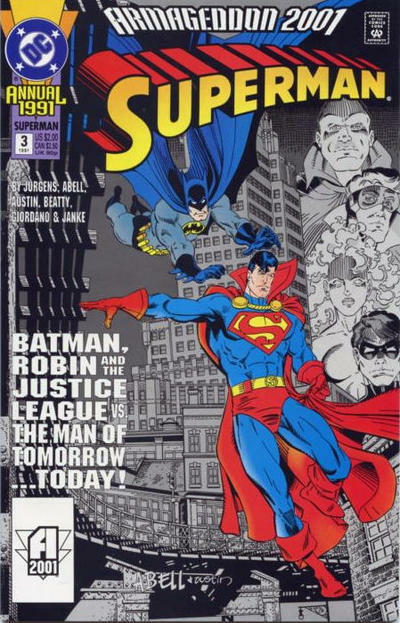 Dan Jurgens was born on June 27, 1959 in Minnesota, where he still lives. He is most famous for his work on the Superman titles, especially THE DEATH OF SUPERMAN storyline, and for creating the superhero Booster Gold. This episode takes a look at his career, and highlights one of his stories, the three issue mini-series SUPERMAN/DOOMSDAY: HUNTER/PREY, cover dated April through June 1994. the story was collected in paperback in 1995. It was also part of the trade paperback SUPERMAN/DOOMSDAY OMNIBUS, published in 2006. This episode also takes a brief look at some of the latest news with Superman and WONDER WOMAN #600. Next Episode: TRUTH, JUSTICE, AND ALL THAT STUFF!